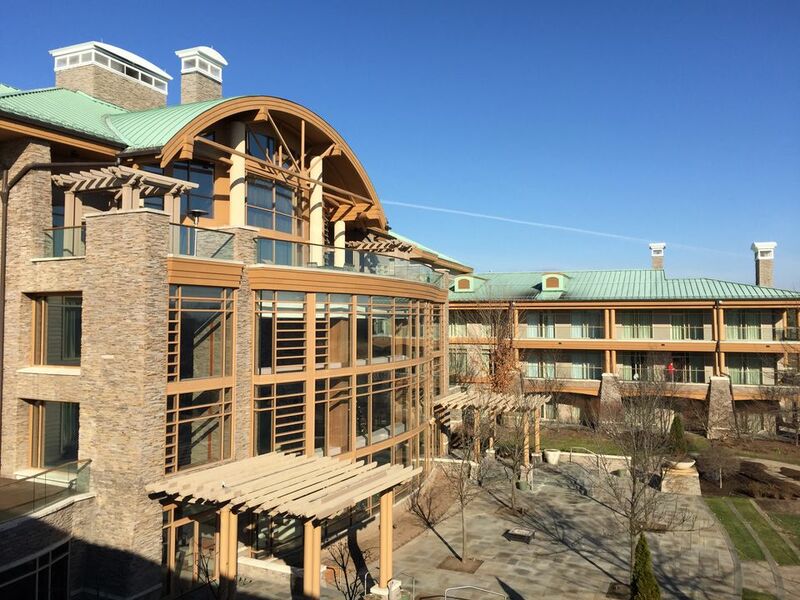 A welcome addition to Central New York, the Lodge at Turning Stone is a serene, 98-suite luxury resort built amidst the ever-expanding Turning Stone Casino Resort. It is part of the property, yet it is a separate, handsome, free-standing building of wood and stone fashioned into a modern, welcoming retreat. Since the weather in upstate New York can be challenging (especially during the traditionally snowy winter), the Lodge is connected to the casino and restaurants via an elevated, glassed-in pedestrian bridge. The most recent addition to the facility is Skana Spa, is a magnificent oasis with an extraordinary couples suite. Each room in the Lodge features comfortably oversized chairs on a private teak deck that overlooks the beautifully landscaped property and verdant golf courses beyond. Luxury getaway in Central New York. Exceptional Skana Spa adjoins the property and features a couples suite. Close proximity to golf and gambling. Very few suites have hot tubs, and bathtubs do not accommodate a couple. No activities for non-golfers, spa-phobics, and non-gamers. Clean, spacious, contemporary suites with French doors that separate the bedroom and living room. Private teak-furnished balcony or terrace (request a suite with a hot tub). Remote control, gas-fueled stone fireplace. Glassed-in shower big enough for two. One-person bathtub. Modern vessel sinks. Lighted, magnifying makeup mirror in bathroom. Excellent Wildflowers restaurant in lobby serves from 6 am - 10 pm. In-room safe large enough to accommodate laptop computer. Local newspaper delivered daily to door. The New York Times, Wall Street Journal and USA Today are available in the lobby. Central New York isn't known as a destination for romance, but since the 2004 opening of The Lodge at Turning Stone Resort, couples may want to to consider the area. Soaring ceilings, romantic nooks, art glass displays, upholstered lounge chairs overlooking the patio and chef's herb garden, and a huge fireplace make the lobby a welcoming place. The refined (but not stuffy) Wildflowers restaurant at The Lodge at Turning Stone Resort opens at 6 am to accommodate golfers who stay here. Uncrowded at lunch but popular at dinner, Wildflowers cuisine and service are extraordinary. The Lodge at Turning Stone has succeeded in creating suites that are at once soothing and elegant. Done in tasteful shades of beige and gray and accented with cherry wood and frosted glass, rooms are private, quiet, and romantic. Luxury linens sheath an ultra-comfortable mattress. In the living room, a remote controlled gas fireplace can set the mood in seconds. The rest is up to you.